Due to Earth’s axial precession, the positions of Earth’s celestial poles shift gradually in a cycle of approximately 26000 years. These days, Polaris is very close to the north celestial pole. 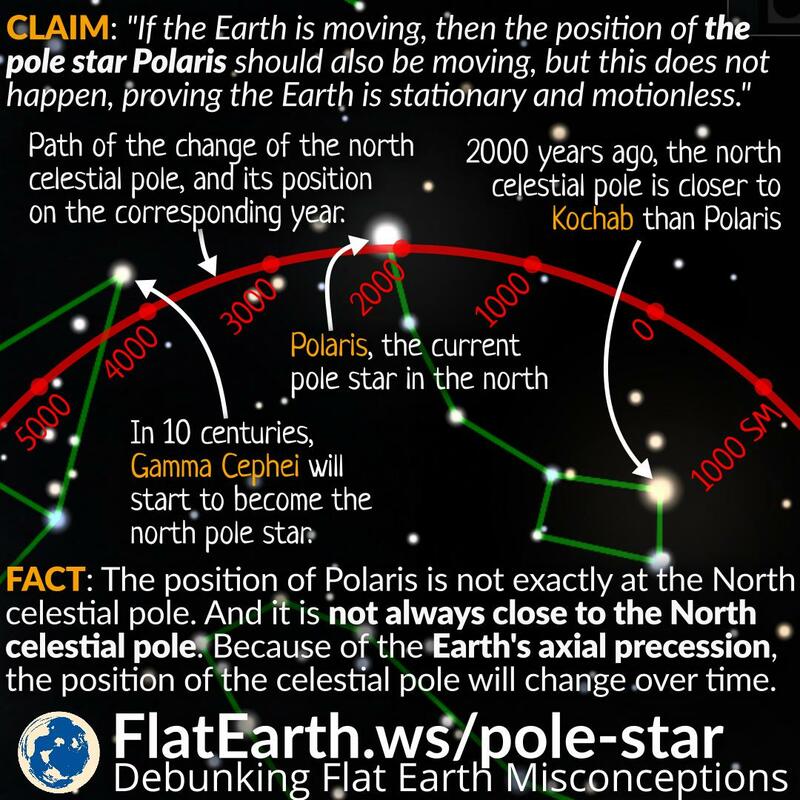 However, 2000 years ago, Kochab is much closer to the celestial pole than Polaris. In the next 2000 years, Errai will replace Polaris as our pole star. 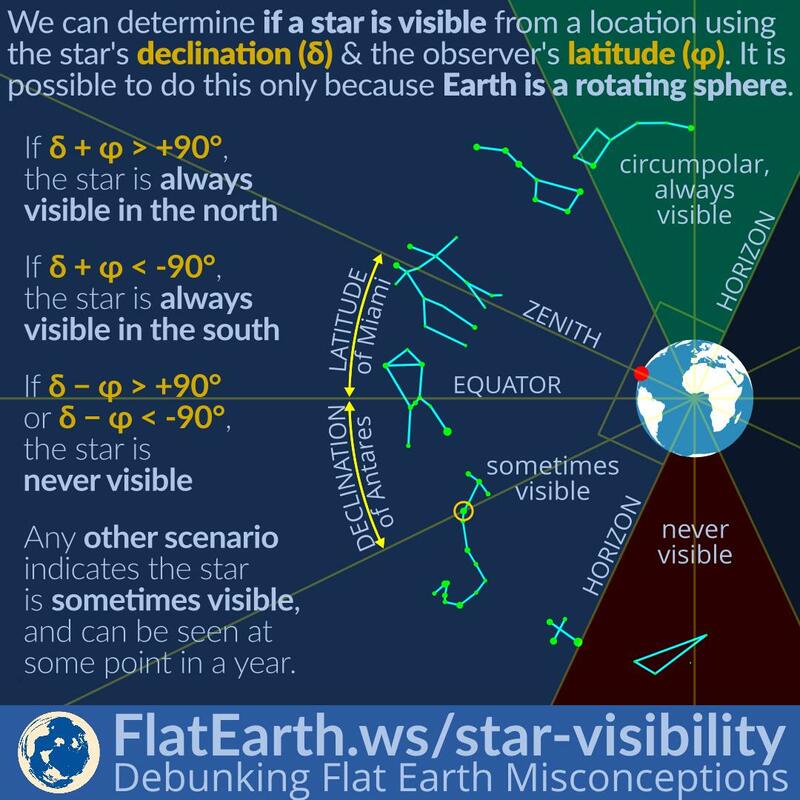 Flat-Earthers claim that the stars are always in the same position proves the Earth is stationary. They are wrong. By observing old star charts from a few centuries ago, the shift of celestial poles can be determined. 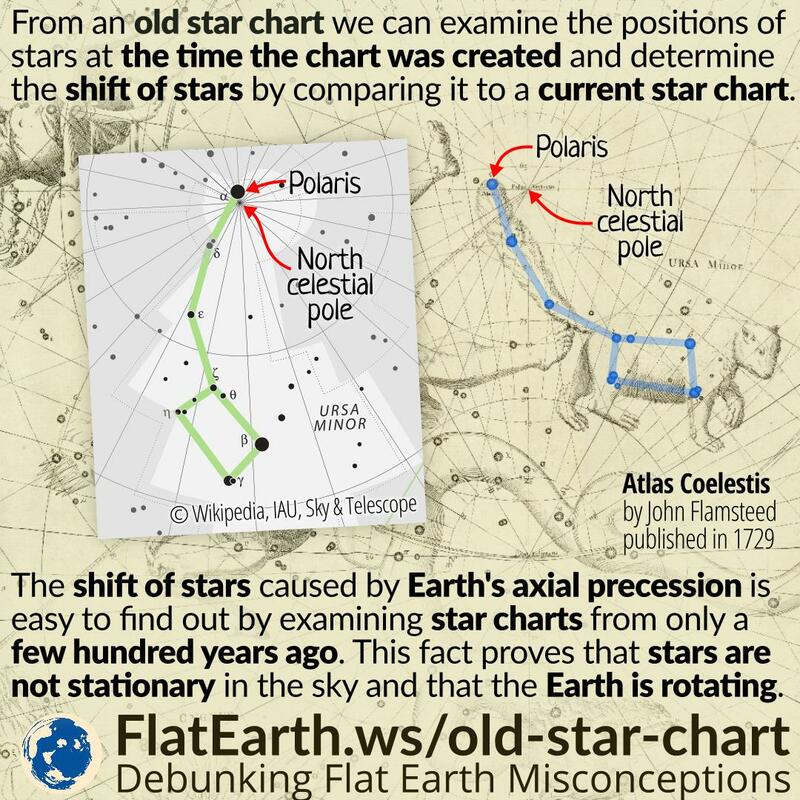 It proves stars are not always in the same position as today, and that the Earth is rotating. Diurnal motion is the apparent daily motion of stars around the two celestial poles due to Earth’s rotation. The stars move in a peculiar way that can only be explained in the spherical Earth model. 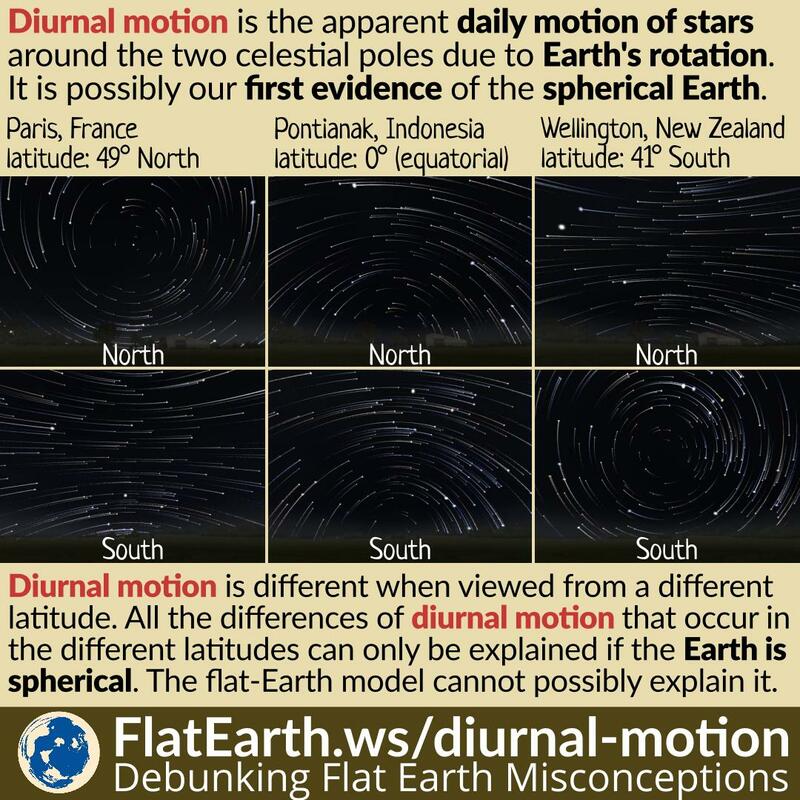 All the differences of diurnal motion that occur in the different latitudes on can never be explained in a flat Earth. Anyone who is in the northern hemisphere can observe the star Polaris, located very close to the north celestial pole. As a result, when observed casually, Polaris appears practically stationary in the same position. 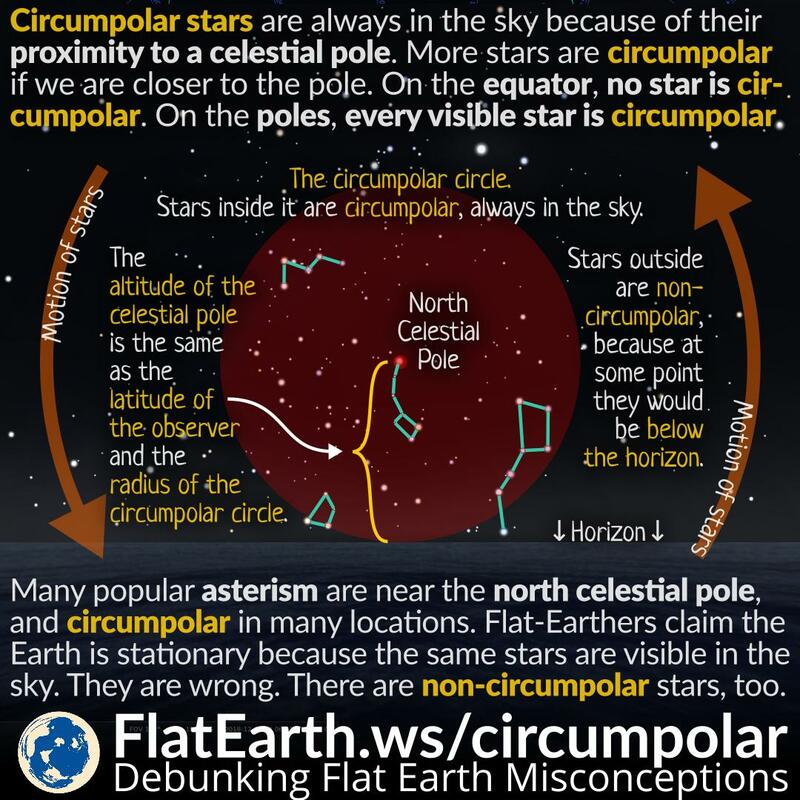 Flat-Earthers claim that the fact Polaris appears stationary as ‘evidence’ that the Earth is stationary: if the Earth is in motion, then Polaris should appear in motion too. They are wrong. Polaris appears stationary because it is very far and its motion can’t be visually observed in the scale of a human life. 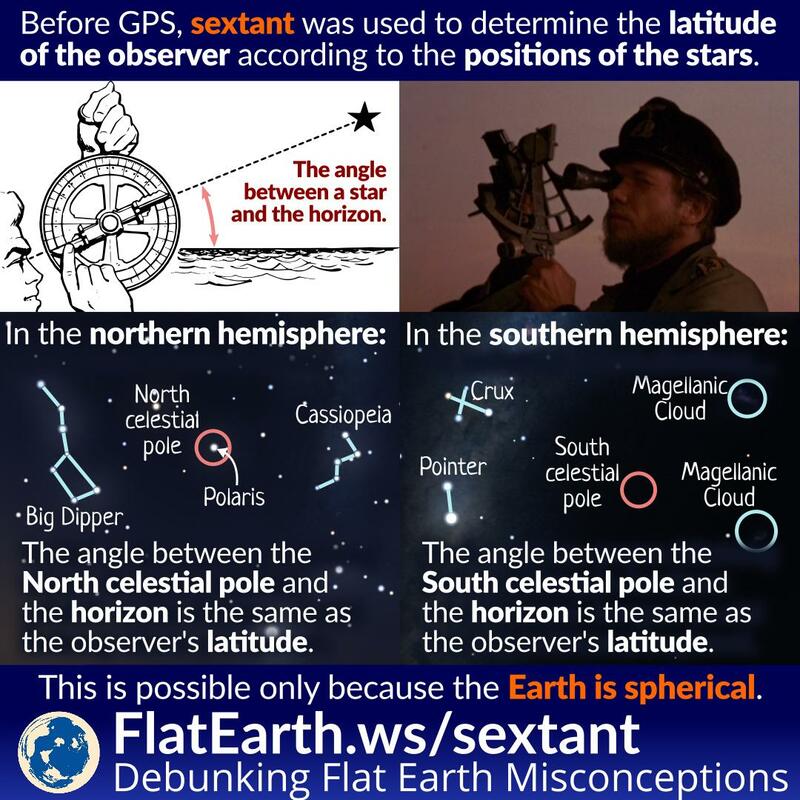 Long before GPS, navigators used a device called ‘sextant’ to determine the angle of a celestial body. From that data, the latitude of their current location can be determined. This can only happen if the Earth is spherical. 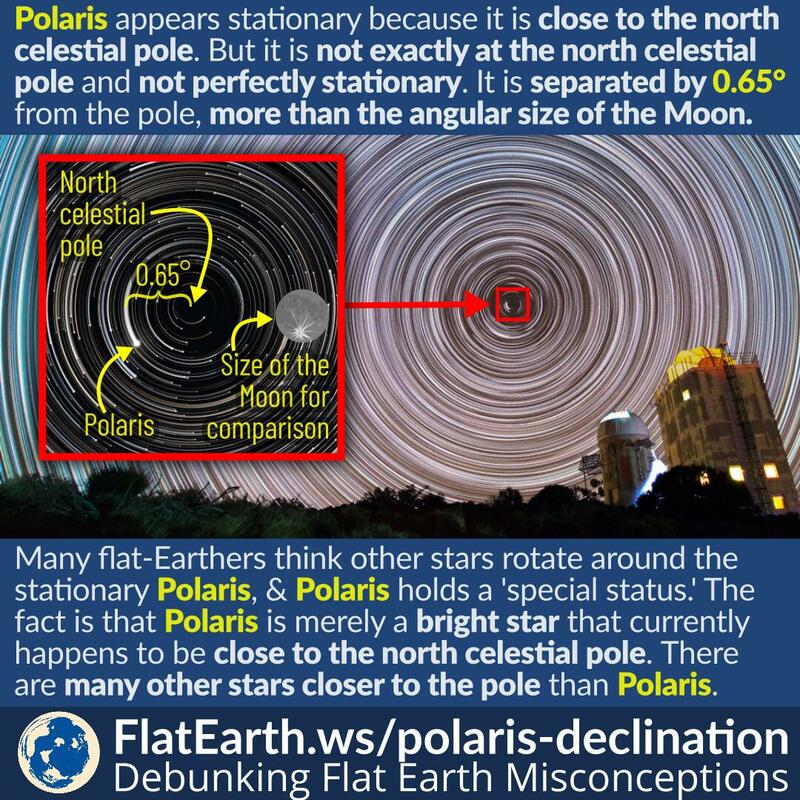 Flat-Earthers often claim that the fact Polaris not appearing to move is ‘evidence’ that the Earth is flat and stationary. If the Earth is a rotating sphere, then Polaris —as they say— should appear to be in motion. In reality, Polaris is indeed moving across the sky. Though it is not something we can observe in a single night, or even in our entire lifetime. To most flat-earthers, the Earth is stationary. Stars are light sources attached to the firmament (for some mysterious reason), and they rotate around Polaris (again, for some mysterious reason). 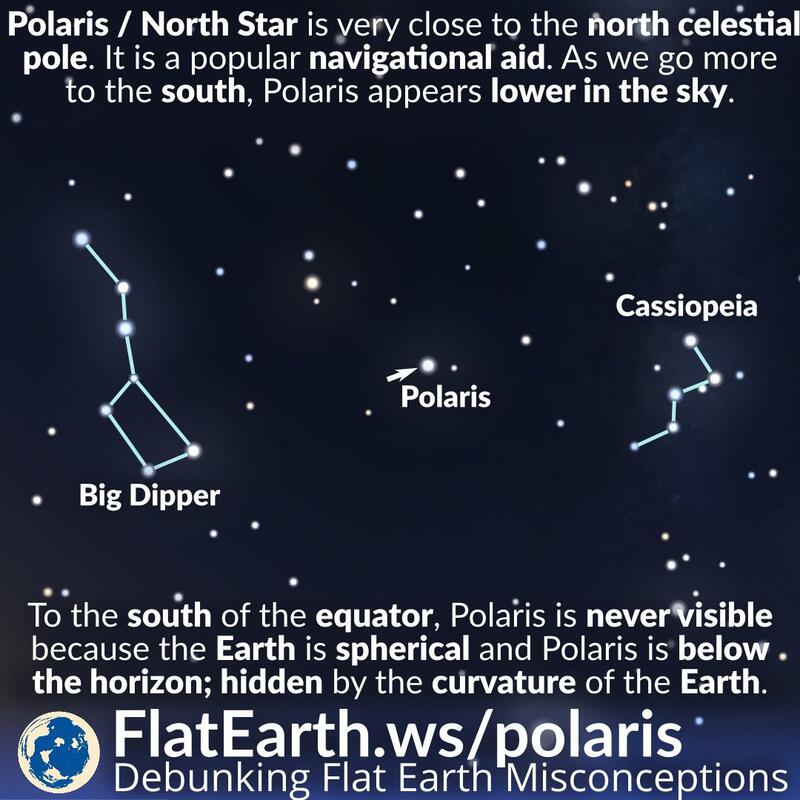 However, they are missing the fact that Polaris is never visible from the southern hemisphere. And furthermore, the southern stars also rotate around the south celestial pole.